Are you interested in hiring Aeolidia to design or redesign a Shopify website for you? I’m so glad! There’s nothing quite like having a team of Shopify experts on your side for an important project like this. But what about web design ROI? Is hiring a professional web designer worth the cost? We’d love to talk with you, but before doing so, maybe you’d like to think about the possible return on investment? Business owners often come to me to figure out if they’re ready to hire us. And over and over, we are brought on late in the game, to fix a neglected website that hasn’t been pulling its weight. Let’s think about when and why to make this investment in your future. Hi, we’re Aeolidia. THE designers for creatives. We’re the best in our niche since 2004. Sounds boastful, but it’s true—try finding another full service agency that uses data to boost your numbers and truly cares about and understands your business, with knowhow from hundreds of projects like yours. We’re a team of designers, developers, content creators, marketers and strategists. We build Shopify websites for design-oriented business owners who are ready to take their business to the next level. But what does “taking your business to the next level” mean, exactly? We’ve found that the business owners we work with have vital things in common. They sell creative, well-designed products, and they’ve built a following around their business… but it doesn’t have to be a huge following. They have a track record of sales, either on their own website, on Etsy, in person, or they have a strong wholesale game… but their online sales numbers aren’t as high as they could be. They know they’ve taken their brand or online presence as far as they can take it on their own, and they’re ready to hire a professional… but they’re not sure when paying for a professional redesign will pay off. We also often work with people who have just started a new business… but they have past experience and know professional design will take them far. Do any of these descriptions fit your business? Are you wondering when the right time to invest is, and what results you can expect? Let’s go! How Does Improving Conversion Rate and Average Order Value Pay Off? When you work with Aeolidia, we design with your sales goals in mind. So you’ll not only be getting a beautiful website, but one that’s designed to retain, engage, and convert the visitors you work so hard to bring there. This means that when we redesign your website, we aim for at least a modest increase in conversion rate and average order value. Watch what happens when we use our sample numbers to boost conversion rate and average order value with a strategic redesign. Wow, right? That shows a 20% increase to website traffic the next year, a 2% increase to conversion rate, and improved order value. A healthy business usually gains traffic year over year, and our work has helped capitalize on it. Our team of experts can help you boost sales dramatically. The cost of a website redesign or branding project can feel intimidating if you’re not sure yet whether your business is ready for the expense. What’s the return on investment for a strategic website redesign? Luckily, we can do some calculations to forecast. Let’s take a look at your own numbers in our guide. 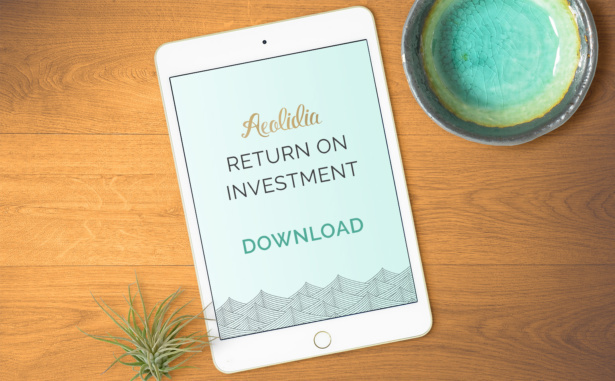 Download our PDF to learn what to expect when you hire Aeolidia. I’ll show you how to forecast using your own numbers, how much additional money you can expect to make when you hire us, and what happens when you delay. What Does Improving Your Numbers Look Like? What If Your Sales Numbers Are Lower? Is It Time For Your Business to Invest In Strategic Design? What Unique Value Does Aeolidia Provide You? When Will Your Investment Pay Off? And How Much? i spent money in marketing, but it was “luck” that brought me customers. I use photoshop and also create images more using photoshop.